The Geometrical Descriptors Plugin calculates 3D geometric descriptors for a molecule. The following window shows a calculation result. 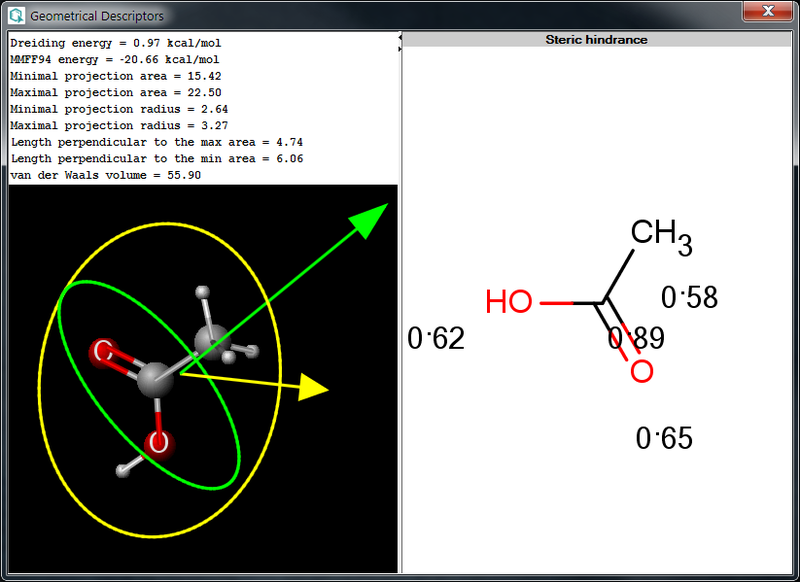 Dreiding energy: calculates the energy of the 3D structure (conformation) of the molecule using Dreiding force field. 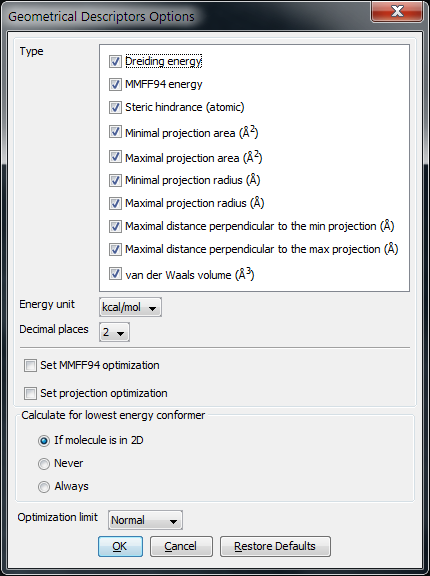 MMFF94 energy: calculates the energy of the 3D structure (conformation) of the molecule using MMFF94 force field. Steric hindrance: calculates steric hindrance of an atom calculated from the covalent radii values and geometrical distances. Minimal projection area: calculates the minimum of projection areas of the conformer, based on the van der Waals radius (in Å2). Maximal projection area: calculates the maximum of projection areas of the conformer, based on the van der Waals radius (in Å2). Minimal projection radius: calculates the radius for the minimal projection area of the conformer (in Å). Maximal projection radius: calculates the radius for the maximal projection area of the conformer (in Å). Maximal distance perpendicular to the min projection: calculates the maximal extension of the conformer perpendicular to the minimal projection area (in Å). Maximal distance perpendicular to the max projection: calculates the maximal extension of the conformer perpendicular to the maximal projection area (in Å). van der Waals volume: calculates the van der Waals volume of the conformer (in Å3). Energy unit: unit of the calculated energy (kcal/mol or kJ/mol). Decimal places: setting the number of decimal places with which the result value is given. Set MMFF94 optimalization: The structure is optimized before MMFF94 energy calculation. Set projection optimalization The structure is optimized before projection area and projection radius calculation(s). If molecule is in 2D: the lowest energy conformer is generated if the input molecule is in 2D; 3D input molecules are considered in the given conformation. Never: the input molecule is used for calculation. Always: the lowest energy conformer is generated (for 3D and 2D molecules as well).